There is a great desire within Les Siècles to play the music that interests us, music from the past and from the present, music that captivates us: both for myself as conductor and for the musicians. What fascinates us all in Ligeti’s music is this polarisation of colour. It is one of the basic principles of our work. Changing instrument to suit the music being played is not solely whimsical: it is about research, coherence and honouring the work. For Les Siècles, playing Ligeti means taking this exploration further and making it more consistent with the notion of colour. From my own point of view, my work as a conductor has had a great connection to the composer. I had the chance to work with the SWR Sinfonieorchester of Baden-Baden and Freiburg, an orchestra that worked with Ligeti himself and that has conserved something of his heritage within their own history. Playing Ligeti’s work with them was a unique and fascinating experience. His music, especially the language of later works, like Lontano (1967), Kammerkonzert and his Cello Concerto (1966), is extraordinarily modern. It’s like it was written yesterday. It fascinates me, and I wanted to share this fascination with Les Siècles. 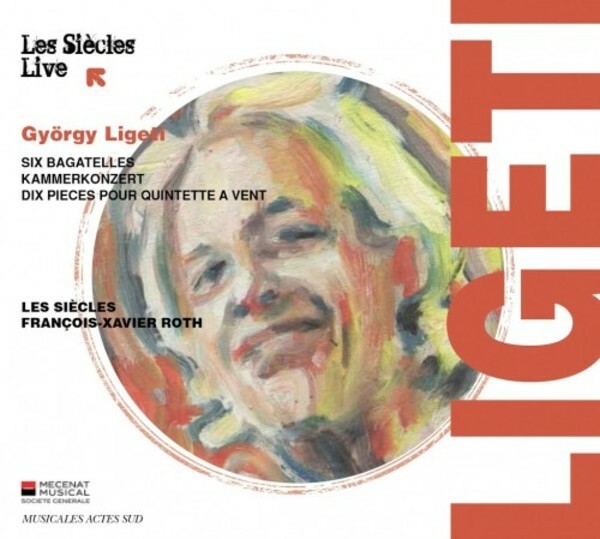 Can it really be ten years since the death of György Ligeti? One of the great individualists of postwar musical modernism, Ligeti carved out his own distinctive identity, leaving a body of work that reaches far wider audiences than many other modernist composers. Like Mahler before him, Ligeti was a complex mix of national and ethnic identities, an ‘outsider’, and life under two brutal dictatorships – Nazism and Stalinism – fostered a distrust of orthodoxies, so that when he moved from Hungary to the west in 1956 he never fully signed up to the Darmstadt-based avant-garde of Boulez and Stockhausen. Yet his constant openness to new sounds and musical possibilities led him to create works that were both accessible and uncompromising, and the music he wrote fifty or sixty years ago still sounds astonishingly fresh. Proof of this comes with a new disc from François-Xavier Roth and the musicians of Les Siècles. More usually heard playing period instruments in performances of nineteenth- and early-twentieth-century music, here they exchange their older instruments for modern ones, while retaining all their customary sensibility to timbral range and variety. The results are enormously captivating, helped by a sympathetically warm but detailed sound-picture. The outer works are two sets of miniatures for wind quintet, opening with the Six Bagatelles of 1953. Culled from Ligeti’s eleven-movement piano work Musica ricercata, these are short movements with gradually expanding numbers of pitches (the first Bagatelle, for example, uses just the notes C, E flat, E natural and G). Stylistically there are nods to Stravinsky and Bartók (to whose memory the fifth Bagatelle is dedicated), but they have a very modern edginess to them which resulted in their banning by the 1950s Hungarian regime. Yet they have huge character, often mischievous, and since their eventual premiere in the 1960s they have become among the composer’s most popular and frequently performed works. The performances on this disc are lively, pert and probing, nothing of Ligeti’s challenging trickiness eluding the players. The other miniatures are the 1968 10 Pieces for wind quintet, tougher musically, and featuring that extraordinary combination (sometimes side-by-side, at others simultaneous) of prolific detail and slow gradation: what Ligeti termed ‘clear and cloudy’ music. Out-of-sync ostinati and mechanistic figuration rub shoulders with sustained textures (sometimes harsh, at others gentle), so that these pieces – none of them more than two-and-a-half minutes long – punch well above their weight. And the same can also be said of the central work on the disc, the larger-scale Chamber Concerto of 1970. With single strings, brass and keyboards added to the mix, and an almost symphonic four-movement layout, this is both substantial and vividly characterful music, and it receives a gripping performance here, less analytic and confrontational than Boulez’s famous DG account, bringing out more of the music’s ‘chamber’ character. The first movement, with its magical opening textures and references to Berg and Messiaen, is the most memorable, but throughout the work Roth and his musicians clearly relish the physicality of Ligeti’s writing just as much as the quicksilver mood changes. The mechanistic third movement emerges with particular forcefulness, while in the virtuosic closing Presto the players rise tremendously to the challenges. This is a hugely attractive disc which should appeal to both seasoned listeners and newcomers to Ligeti’s music. The programme is a well-balanced one, and the presentation exemplary. Don’t be misled by the short playing time (some 44 minutes): there’s more music packed into this than on most discs almost twice the length.